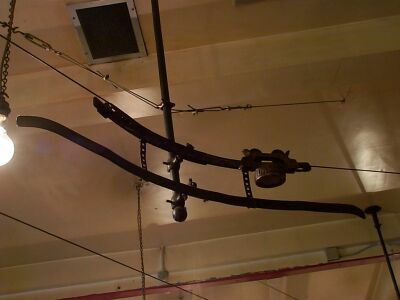 A special device was produced to enable wire lines to go round corners if the layout of the shop required this consisting of two curved rails each supported from a vertical pole fixed to the ceiling. The top rail holds the wire and supports the car and the lower rail steadies the car as it rounds the corner. It required the use of a "curve car" with a shorter wheelbase than normal. 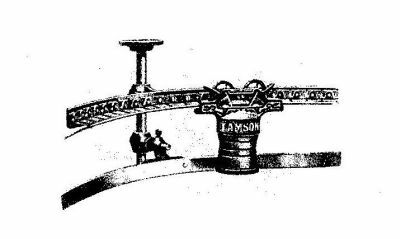 A curve on a Rapid Wire system from a Lamson brochure of 190- where it is labelled "Style 3-B". 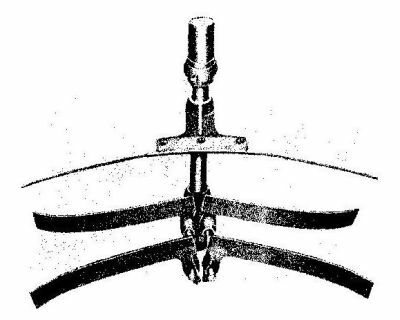 It is claimed to be "the only successful corner-turning device ever invented". This curve car, offered for sale on eBay, has spoked wheels like the drawing at the top. The "bridge" was a somewhat similar device that allowed the wire to be raised over the top of obstacles such as fixtures or partitions. The illustration is captioned "Style 4-B". I have not seen any examples still existing. 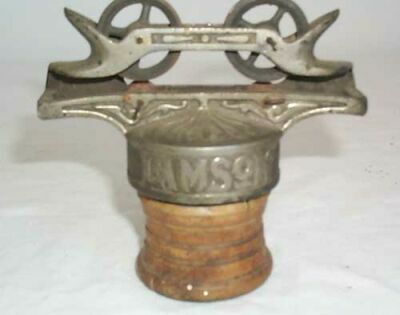 Lamson brochure of 190-.